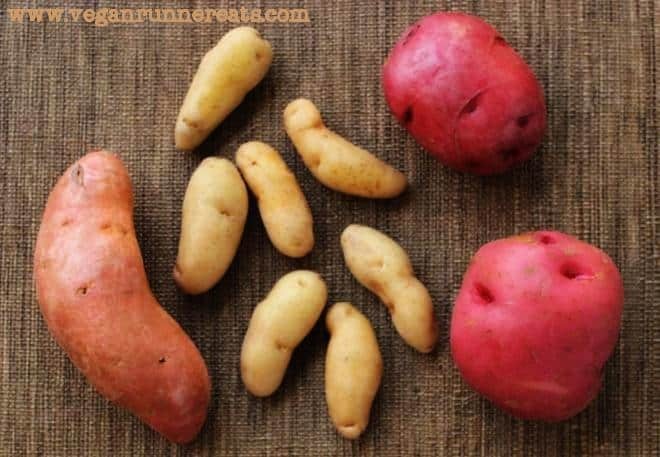 Vegan Runner Eats » Articles » White Potatoes – A Nutritional Powerhouse That’s Seriously Underrated. Plus: Why Potatoes Are Not Fattening. I never get tired saying that potatoes are one my favorite vegetables: I cook them at home a few times a week, plus I’ve featured a number of recipes with potatoes on this blog. White potatoes were a big part of my menu while I was training for a marathon last November, and later during my running streak that lasted from Thanksgiving till New Year’s Day. So whenever I hear someone declaring that a white potato is a starch-laden vegetable with hardly any nutritional benefits that will make us all fat and devoid of energy, I shake my head with disappointment at yet another expert who didn’t do their basic homework. Carbohydrates have gotten a lot of bad rap lately. New low-carb diets keep popping up every day with claims of turning us into slender, energetic machines if only we stop consuming all carbs altogether. And yet our society is growing fatter and unhealthier year by year… What’s going on? – Middle East – wheat, oats, legumes. These plant foods were staples in diets of people who performed lots of daily physical labor and traveled long distances by foot. Julius Caesar’s legions preferred to eat starch-based meals when they went out to war and even complained if they were fed too much meat (source). With all of the carbohydrates they were consuming, these ancient nations were still healthier and more slender than we are today as a society. If we look at the traditional diet of the rural populations of Russia, Poland, and Ireland in the 18-19th century, we see that potatoes were an important staple food of people who performed grueling physical labor every day. So if potatoes (and other starchy plant-based foods) have successfully fed us humans for so long, how come they get so much bad rap now? It’s true that white potatoes consist almost exclusively of starch, fiber and water. While fiber and water fill us up without affecting our waistlines, potato starch is often considered fattening. However, it’s not so bad after all: the type of starch found in potatoes consists of long chains of glucose that are much longer than the chains found in sugar. Long glucose chains are broken down slowly in our intestines, so the glucose is absorbed into our blood at a slower, more constant rate than sugar does. This slow absorption doesn’t cause an insulin spike (insulin is a hormone that induces glucose to be stored as fat). Therefore, glucose from potato starch doesn’t get transformed into fat as readily as glucose from sugary foods. The presence of fiber in potatoes also slows down glucose absorption in our bodies. As a result, potatoes supply us with energy without sudden spikes and later crashes. Besides, they keep us fuller and more satisfied for longer. Now that we’ve determined that potatoes are a great gut stuffer, let’s take a look at their nutritional profile. This is all well and good, you might say, but how come we’ve thought of white potatoes as fattening for so long? The answer is simple: we’ve become too dependent on our taste buds. We forgot the simple pleasure of a baked or steamed potato. They seem way too plain to us, we have to add lots of butter/fat/bacon/you name it on top. Or better yet, we get excited with the idea of deep frying potatoes and sprinkling them with lots of salt or MSG-containing seasonings. The humble plain potato has lost its appeal to our jacked-up taste buds – it simply has become a fat/junk delivery device for our stomachs. No wonder we are now fatter and unhealthier as a society while blaming white potatoes! Eggplant Rollups with Black Bean-Potato Stuffing – the most popular recipe on Vegan Runner Eats! To see more recipes with potatoes on my blog, click here – or use the world wide web for more inspiration! A number of talented doctors and researchers have been talking about the benefits of whole food, plant-based diet for years – just look up the works of T. Colin Campbell, Caldwell Esselstyn Jr., Neal Barnard, Michael Greger, John McDougall. The latter is especially passionate about starch-based diets – click here to see his article about treating diabetes with a low-fat, high-starch dietary approach. I hope this article has convinced you that potatoes are not as scary as the media often presents them! Question of the day: What’s your favorite potato dish? Tagged Caldwell Esselstyn Jr, John McDougall, Michael Greger, potatoes, T. Colin Campbell, The Starch Based Diet, vegan nutrition, whole food plant based diet, whole grains. Bookmark the permalink. 9 Responses to White Potatoes – A Nutritional Powerhouse That’s Seriously Underrated. Plus: Why Potatoes Are Not Fattening. Glad you share my opinion, Shannon! Thank you for the comment! No need to get upset about “health experts”. A lot of time they get kickbacks from the beef/dairy industry. My favorite experts are Jeff Novick, John McDougall, Nathan Pritikin and Dr Greger. Their books and knowledge is all I need. Others, Furhman… are pushing supplements too hard and I don’t like that even though, he and others do make good points. And while I am posting a comment, I would like to add that coconut anything is really bad news for jungles and our arteries. I love cookbooks but as soon as I see “coconut” I put the book down. Thank you for the insight, Nadege! I agree that listening to experts blindly is not always a good idea as some of them are directed by other reasonings besides our well-being. Thank you for posting this! I ALWAYS get weird looks when we go out to eat and I ask for a plain baked potato. The only time I even season any potatoes is when I’m cooking them in the frying pan and even that is just a bit of olive oil. Or when I’m doing something slightly more complicated such as Agave Roasted Potatoes. I would take care in comparing modern diets to our ancestors’ diets though. A lot of times their diets were a by product of the amount of labor it took to grow crops in their areas and a lack of access to other food sources. Glad you’re sharing my admiration for potatoes, Anita! I love plain baked potatoes probably even more than the ones topped with any kind of add-ons. As for our ancestors, I agree that their geographical or labor limitations affected their diets, but since those diets worked fine for their health and performance, maybe that’s one lesson we could learn from them – the answer to good health isn’t brought from far away but exists right next to us.